Over the last few years, Lynne M. Thomas & Michael Damian Thomas ran Kickstarters for the two-time Hugo Award-winning Uncanny Magazine Years One, Two, Three, and Four. We promised to bring you stunning cover art, passionate science fiction and fantasy fiction and poetry, gorgeous prose, and provocative nonfiction by writers from every conceivable background. Not to mention a fantastic Parsec Award-winning podcast featuring exclusive content. Through the hard work of our exceptional staff and contributors, Uncanny Magazine delivered on that promise. Stories from Uncanny Magazine have been finalists or winners of Hugo, Nebula, Locus, and World Fantasy Awards! Hosted and produced by Michi Trota and Matt Peters, Uncanny TV will be the launch of our community-based vid channel, featuring exclusive geeky content related to Uncanny and the Space Unicorn Ranger Corps community! Matt Peters & Michi Trota will host a short (20-30 min) variety talk show, Uncanny Magazine-style: highlighting creators in SF/F working in a variety of art forms and projects, focusing on people building and nurturing their communities, particularly highlighting marginalized creators. They’ll talk about topics that can be serious, but the overall tone of the show will be to celebrate the things we enjoy and the people who make our communities good places to be in SF/F. We at Uncanny think we’re doing important work, and we’d like to continue. 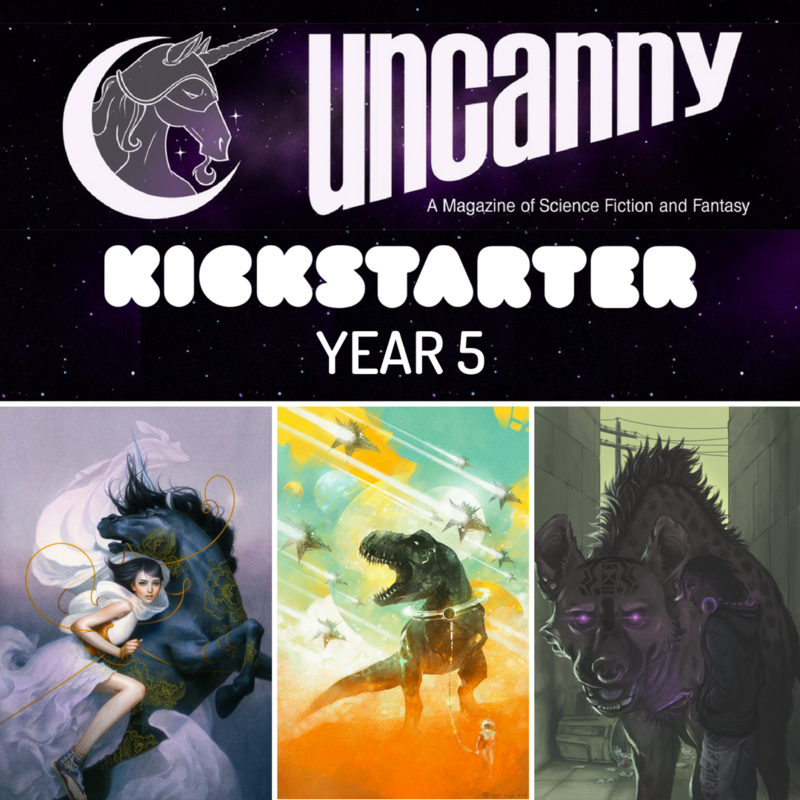 Please consider supporting Uncanny Magazine Year Five! 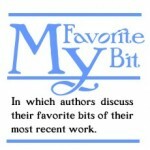 What’s Matt and Michi’s favorite bits? When I came onboard as a reader for Uncanny, I was concerned that I wouldn’t be a good fit. Obviously, that wasn’t my favorite bit. I grew up loving sci-fi. My dad and I bonded over classic Star Trek and Star Wars and when he told me I could actually read books that furthered the story past what was on screen I was hooked. I read as much as I could by whomever I could. I’ve read so much sci-fi and fantasy growing up, I can’t even begin to tell you who all the authors were. At one point, if a book had a rocket ship on the cover and it was in stock at the library, that was good enough for me. When Michi invited me to be a submissions editor for Uncanny, I was excited to begin. Suddenly, there was so much content flying at me at one time, I was overwhelmed. I panicked. I loved sci-fi, so this should be right up my alley, right? After talking to my wife, we came up with a great solution: we’d take turns reading submissions to each other as we played Tetris (Dolores joined Uncanny as a submissions editor soon after). That’s where it finally clicked for me. A big part of the allure of Uncanny is the camaraderie. There’s a communal aspect. People just like me who grew up reading the same stories I love feel so passionate about them that they came up with their own. Maybe it was because they wanted to honor it. Maybe it was because they felt they could do it better. Maybe they just had something on their mind and staging it in a fantasy realm was just disconnected enough to be honest about their private dreams and desires. Our true nature reveals itself when we think no one is watching. How incredibly brave to put that story to paper or keyboard and share it with the world on the off chance someone might find a kinship in what you created. Have you ever looked into someone’s eyes as they retell a story that they truly connect with? That driving, nervous energy… That is my favorite bit of Uncanny: the passion. After four years as Uncanny Magazine’s Managing Editor, I thought it would be a lot harder to pick what my favorite bit about Uncanny is, but in fact, the answer was pretty easy: What I love the most about Uncanny is how its community shows me every day why stories, and who tells them, matters. The people I’ve met through Uncanny have made an incredible difference in my life, and collaborating with them in different ways has brought me so much joy, and has helped me to hone my own craft as a writer. The creativity, willingness to test boundaries, and passion for craft among creators and fans that I’ve encountered has been endlessly surprising. There are so many writers whose work I became introduced to because of Uncanny, and if all their stories, poems, and global working essay that I’ve added to my “to read” list physically manifested into an actual pile, I’d probably have been buried under it by now. But what’s impressed and inspired me more than anything is the vibrant network of mutual support and admiration I’ve seen being continually built among creators and fans. The outpouring of joy and signal boosting whenever there’s a new release, whether it’s for an Uncanny issue or a novel or anthology, is one of the best things to see taking over my feeds on social media. And what really gets me, every time, is when someone shares a cool story about how something they made inspired someone else to create something completely unexpected. I have a friend who’s written songs based on stories and novels she’s fallen in love with. I know acrobats who craft their acts to tell superhero stories. I’ve seen fans honor creators with beautiful pieces of fanart, and who’ve taken a page from their favorite stories to build charity and activist organizations. These are people who are taking a deep and abiding love for SF/F and using it to enrich their lives and the lives of others, often for no other reason beyond just wanting to make a positive difference, no matter the scale. Seeing just how varied and thriving the greater ecosystem of geeky creators actually can be has been a necessary balm, especially since the election. Finding a reason for joy and inspiration to create new stories, new kinds of art, new connections among strangers, is especially important in the face of oppression and rising fascism. When we can see others being creative rather than complacent, building bridges rather than walls, it makes a difference. It’s why I’m excited by the prospect of being able to take Uncanny’s mission of supporting gorgeous, experimental, passionate storytelling even further with Uncanny TV, and dive even deeper into more stories about why SF/F matters. And getting to do this with Matt Peters, a friend and colleague I enjoy collaborating with, and who has inspired me to do better in my own work? That’s definitely one of my favorite bits! Managing Editor/Uncanny TV Presenter Michi Trota is a two-time Hugo Award winner, and the first Filipina to win a Hugo Award. Michi is an essayist who has been published in The Book Smugglers, The Establishment, The Learned Fangirl, Invisible: An Anthology of Representation in SF/F, and Uncanny. She’s spoken at C2E2, the Chicago Humanities Festival, on NPR, and at universities and other organizations. Michi is a firespinner with the Raks Geek Fire+Bellydance troupe. She serves as president of the Chicago Nerd Social Club Board of Organizers and lives with her spouse and their two cats. Her secret mutant superpower is to make anyone hungry just by talking about food. Find her on Twitter @GeekMelange.